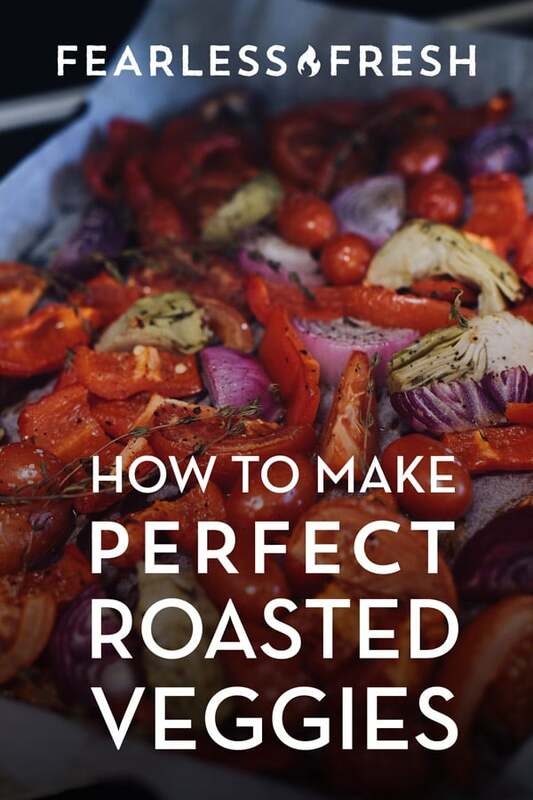 Why learn how to roast vegetables? Because they’re not only good for you, they’re tasty! I get very excited about fresh produce around here (I like food) and I love coming up with ways to use all that goodness in my recipes. One of my favorite ways to use fresh vegetables is roasting them. Roasted veggies can be a side dish at your summer BBQ, alongside a perfectly roasted chicken, as a warm and savory spin on breakfast, or something delicious to snack on in between meals. They’re also great to serve during the colder months when you’re craving something warm, flavorful, and still healthy — because I all know how hard that is to find! Before I tell you to start roasting everything in sight, which is what I want to do once I get fresh veggies in the kitchen, let’s talk briefly about what roasting really is and how to make sure your vegetables come out spectacular every single time. Learning how to roast vegetables requires only two seconds of background. Once upon a time, roasting specifically meant cooking food over an open flame. Nowadays that tends to be deemed “grilling”, and roasting is the type of cooking that happens in an oven. Food is roasted when it is cooked by dry heat. Basically, the air in the oven gets hot, comes into contact with the food you’re cooking, and voilà! Roasted goodness. Roasting vs. baking – huh? Cooking food with hot air using an oven…sounds a lot like baking, right? Baking and roasting are very similar, but there a three main differences between them to remember. Heat: Roasting happens at higher temperatures [400°F (204°C) and above], while baking tends to happen between 300°F-400°F (149°C – 204°C). State or “structure” of uncooked food: In general, “baked” goods start relatively unstructured (think cake and cookie batter, uncooked pastry dough, etc.) while “roasted” food is already structured and is simply cooked to add a crust (think vegetables and meat). Fat: Roasted food tends to be coated in an oil (butter, coconut oil, olive oil, etc. ), while in baked goods, the fat – which can sometimes be the same kinds of fat – is incorporated into the batter. First and foremost, roasted vegetables are amazing because they’re delicious. When cooked properly, the sweetness of the veggies shine through (yes, vegetables can be sweet), and the flavor is heightened by an unbelievable crisp on the outside. It’s the perfect union of texture and flavor. Think savory on the outside, sweet on the inside. The beauty of roasted vegetables is that they’re a great way to get an extra serving of veggies into your day, and they’re also handy for using up vegetables when you have too many hiding in your fridge. When you’ve overdone it at the grocery store or farmer’s market (hooray summer!) and have too many vegetables on hand, making a big batch of roasted vegetables is a phenomenal option and prevents food waste/saves money. There’s a great post right here on Fearless Fresh about how to make your vegetables taste more exciting, and I’ll give you a hint — it has a lot to do with seasoning. It starts with salt and ends with acid, like vinegar or lemon juice. But! The key is to not salt too early, lest your perfectly roast veggies turn soggy because the salt leached out all of their moisture. So, be sure to salt last, right before serving. There’s a caveat, though and you can use it to your advantage. Hard veggies, like potatoes, yams, and cauliflower, can actually soften faster if you salt them before cooking. That said, they’ll get soft without getting brown, because they’ll essentially be steaming in their own moisture. So for the perfect combo of browning and crunch, I’d suggest cooking them longer and salting at the end. Pro tip: Using a large-crystal sea salt on your roast vegetables right before serving not only looks super profesh, but also adds a satisfying crunch. Just don’t go overboard or they’ll be way too salty. Remember that large salt grains = more salty flavor per grain! Here’s a big reason most people end up with mushy veggies when learning how to roast vegetables. The main reason that roasted veggies often don’t reach their full potential is because of pan overcrowding. When vegetables are cooked, they release moisture and soften. If the vegetables are too close together in the pan, the released moisture rises up from one vegetable and runs into its neighboring veggies. When those nearby veggies come into contact with the hot, vaporized water that’s now floating around, they go through a different kind of cooking process: steaming! Hot vaporized water + food = steamed food. This is VERY different from roasting and will not give you the same sweet, crispy results. In fact, you’ll just end up with soggy veggies. Remember this: overcrowding the pan causes the vegetables to be steamed by one another, and is a sure way to get mushy, bland, veggies. Another trick to learning how to roast vegetables is to understand that not all vegetables have the same needs. Some vegetables — like zucchini, broccoli, or mushrooms — only need 20-30 minutes in a hot oven to get the perfect crust and flavor. Other vegetables, like potatoes, onions, or winter squash, need more like 45-60 minutes to cook fully. A good method to make sure all of your vegetables are properly cooked is to sort the veggies by cook time and start cooking the vegetables with the longest cook time first. You can pull them out of the oven after a bit of time and add the shorter cooking vegetables to the pan (as long as you don’t overcrowd them!) to make sure they all finish cooking around the same time. This method requires a tiny bit of thought, but it’s worth it to have a diverse group of perfectly cooked vegetables! Another method is to cut the longer-roasting vegetables into smaller pieces, similar to this recipe for roasted potatoes and zucchini with herbes de Provence. Perfectly roasted vegetables need high heat! The last factor with roasted vegetables is to make sure you’re cooking them in a HOT oven. Crank that sucker up to 425°F (218°C) or 450°F (232°C) to get the perfect roast. Yes, really. You can’t get crispy vegetables without heat! Have questions or comments about how to roast vegetables or other foods? Let us know in the Cooking Support Group on Facebook! 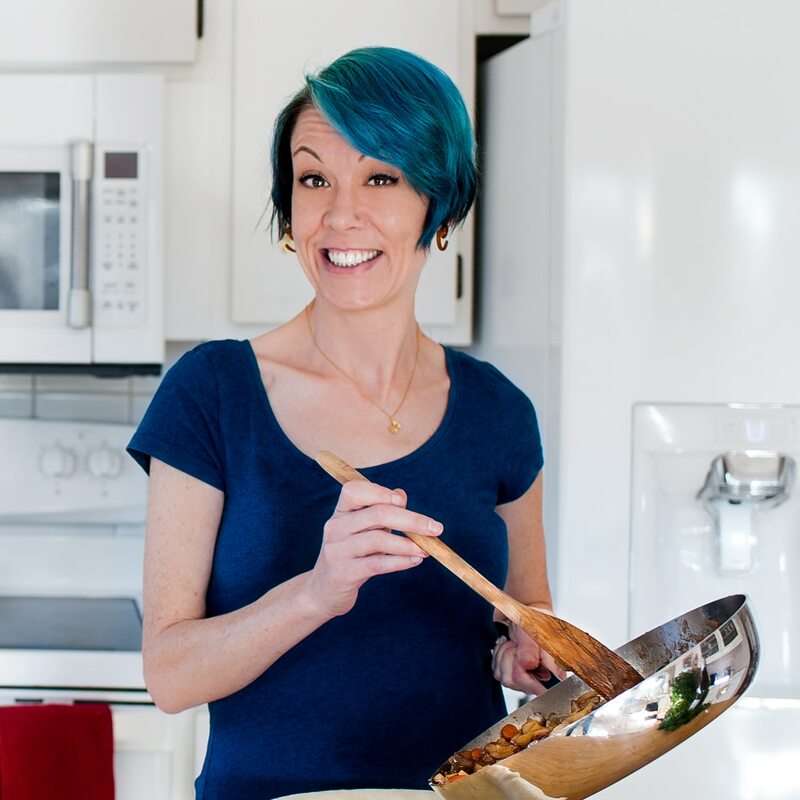 With a passion for food, a love of flavor, and a fascination with the science of cooking, Amanda is game for most anything in the culinary world. She’s not afraid to try new things or experiment with new techniques, and so far she’s only met a few foods she hasn't liked. Her first love is baking sweet treats, but can get down with the spicy and savory too! Check out her personal site to see the full scope of Amanda’s interests.